 I love sharing our cabinetry projects with all of you! I am so grateful that our clients love their completed kitchens as much as we enjoy designing and working with on them (and with them!) Anyone that has ever renovated knows how overwhelming it can get; there are a lot of decisions to be made! Marc and Natasha Buergstaller came to us last fall looking to design their dream kitchen. They owned a beautiful, quaint one story home in Kimberley, up near the ski hill. Problem? It wasn't their dream home. Not interested in building new, Marc and Natasha embarked on a renovation that included adding a second story to their one story hillside home. Not all white kitchens are created equal. This one stands out because we have soft chrome hardware, polished copper pendants, and the obvious star of the show: the horizontal fir island! It’s not just any accent island, it’s bold, it's warm and it adds texture and color to the space. Fir has a tight, consistent grain that creates a bold statement and our clients fell in love with it! When we first started working on the design plans our client was thinking that maybe they wanted white shelves, to create an all-white look modern vibe. But as we got through the process, we realized that we really wanted them bring contrast and continuity to the perimeter of the kitchen by using the fir to bring everything together. I'm so glad we went for it, because it’s enough to warm up the space while also bringing out those amazing stools. Marc and Natasha chose a matte gray island top that resembles concrete. These stunning tops are easy to keep clean and do not absorb spills the way concrete does. The solid matte finish perfectly balance the warmth and texture from the fir island. We’re loving these copper hanging pendants above the island. It's definitely industrial, but we love how they compliment the warm orange tones of the natural fir! We've been big fans of these wishbone padded gray stools since the day we saw them because they create this warm, personal feeling that just makes you feel right at home. In January 2018, this project was nominated as one of the Best Residential Projects in British Columbia by the Architectural Woodworking Manufacturers Association of Canada (AWMAC). This prestigious honor will be recognized in September at the Annual Awards of Excellence. If I had to choose one thing I love most about designing cabinetry for homes, I don’t know if I would be able to do it. But I do know that somewhere near the top of the list of favorites would be differentiating each individual project to suit the clients lifestyle. It’s a fun creative challenge to make each client’s vision completely distinct and unique. But nothing is harder than trying to design your own space. My home started off... hideous. It was one of those typical houses that desperately needed to be loved and updated. I will have to dig up some before shots for you guys to see. In order to achieve this design, we had to remove a lot of walls and vault the ceiling. Basically, we gutted the entire front end of the house back to the beams and re-build. Along the sink wall there is this huge window, which brings in so much natural light. This also means that there is not much room for upper cabinets. For the more traditional look I was going for, I chose to add a connecting valance over the sink for a more traditional look. We chose to stagger the corner cabinet and the fridge cabinet and bumped out the box over the microwave to offer more visual interest. To the immediate right of the stove is roughly where the door entering the kitchen was. I didn't want to go too designer on the space because I knew there were a few must-haves I wasn't willing to compromise on, such as a beverage fridge in the island. So I went with a standard stove with an over the range microwave that has a built in fan for cooking. I wanted a couple of pot drawers on each side of the stove. Because this isn't a huge kitchen, cabinet real estate is super important! We chose a blind corner cabinet instead of a lazy susan, in order to avoid losing space on the left of the stove. My island is probably my favorite part of my kitchen, and I guarantee the most used. My clients have been calling it "The Superman" island lately. The superman shape PERFECTLY fits the shape of the kitchen making it the most functional space to work, cook and entertain. wine rack and beverage fridge? Since the space is not very large, there was no space to put a built in pantry. My talented and smart dad solved this lack of storage space by designing a massive built in hallway closet. The first cabinet is wear I store all my cleaning supplies, vacuum and any household DIY items like lightbulbs and tools. The center section is our coat closet with 2 adjustable shelves that serve as shoe racks. The left side is were we keep all of our pantry items. Across from the pantry is our main bathroom and this super adorable cabinet my mom designed and built for me. If you didn't know, my mom does all of our cabinetry finishing. She has great eye for details and loves experimenting with different techniques. This gorgeous cabinet hides my router! Haha! I have already shown you how I remodeled my hideous ensuite bathroom into a girly spa-esque space so I will just show you this picture and let you read more about it with the link below! And yes, I did finally hang the mirror and put handles on the cabinet. Instead, I will show you my main bathroom. What I love about this space is the dramatic splash of color on the walls paired with the light tile that was also used in the kitchen. This tile is very modern for the style of cabinetry I chose; however, I think it creates a fabulous blend that is both homey and inviting as well as a bright and modern. Ok, let's talk about this hickory vanity. I can't help but fall in love with it everytime I see it, i love how organic it makes the room feel. The selection of hickory turns out to be a specialty lumbar pull. The knots add a lot of character but the overall look is bright and natural. Hickory typically has lots of light sapwood and dark heartwood variations (like the toe kick and end panel.) I don't know how it managed to come out like this but wow! There you go! A look at the cabinetry I have in my home! Below you can tour around at your own pace and check things out, just click and drag around. TIP: Click on the 4 Arrow Icon (3rd from the right) to make it full screen! Liked this project? View Similar designs! Today we are giving you an exclusive look into our designer, Tiffany's brand new home! This project reveal is one of our most requested and most anticipated projects of 2017. We are so excited to walk you through how it all came together! 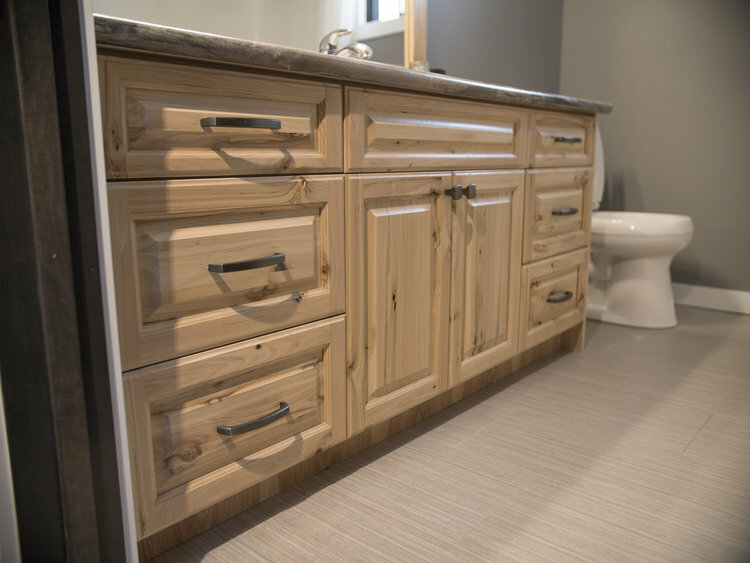 Today we are giving you a behind-the-scenes look at the creative problem solving that took place behind our cabinetry design project for CZ Construction and Jerry Raduy. The use of multiple woods and 2 toned color make this project one of our favorites, and we are excited to walk you through the design process! Provide custom kitchen cabinetry for the Spring family in Cranbrook, BC for their new home by Jim Smith Lake. The cabinetry includes kitchen perimeter, island and bathroom vanities and laundry room. This wonderful home was completed in Cranbrook this fall for Josh and Jenelle Lowden.